SAULT STE. MARIE---You win some, you lose some. That's what the Escanaba Cubs baseball team did this weekend at a tournament in Sault Ste. Marie. On Friday, the Cubs lost to the Eastern U.P. Travelers, 7-5, but then routed the Sault Ste. Marie Canada Black Sox, 17-0. Then on Saturday, the Cubs took out Petoskey, 9-3, only to lose to Alpena, 4-3. That left the team with a 2-2 record at the Lynn Auto Parts Invitational, which fell from a ten-team tournament to an eight-team event when two teams dropped out. Escanaba needed the Black Sox to beat Ishpeming to advance to Sunday's Final Four, but the Canadian team blew a 4-0 lead and lost, so the Cubs will be coming home. In Saturday's win over Petoskey, Ben Kleiman pitched well on the mound to earn the victory. Nick Vandermissen and Alex DeHaan each went 3-for-4. But the team had a hard time generating offense against Alpena later in the day. Bailey Lamb suffered the tough-luck pitching loss in that game. 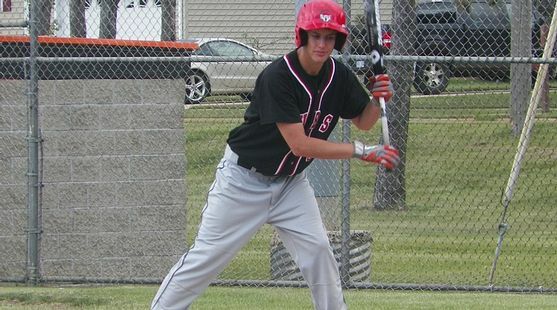 On Friday, Trent Schwalbach's two-run homer against the Travelers tied the game at 5-5 in the sixth inning before the home team scored twice against losing pitcher Matt Jensen. Trent Schwalbach during a recent game. Schwalbach pitched the first three innings, and allowed five earned runs in getting a no-decision. Against the Black Sox, the Cubs had one of those "stats building" games as in the fourth inning, all nine batters who came to the plate scored runs. "I'm sure that's happened before, but I don't remember when," Ohman said. David Falish pitched all four of those innings to earn the win on the mound. Kleiman went 3-for-3 at the plate and drove in four runs. Justyn Docuette had two hits in the game, and he also had two hits in the loss to the Travelers. "We actually played well today," Cubs Manager Tom Ohman said Friday night. "We just can't catch any brakes. Against the Soo (Travelers), they had some crazy hits and we didn't turn a tailor-made double play when we could've. Then, against Canada, we pounded the ball." But they couldn't pound the ball when they needed to on Saturday against Alpena, so the Cubs missed a chance to play on Sunday for the third straight tournament. ESCANABA JUNIOR CUBS GET SWEEP---The Escanaba Junior Cubs improved to 10-0 on the season Friday night with a doubleheader sweep of the Gladstone Junmior Indians, 10-1 and 15-4, at Don Olsen Field. In the opener, Jeff Lyle pitched the first four innings and Brandon Punzel pitched the last three. In the nightcap, Andrew Miller piyched a complete game and Andrew Sedlar hit his first Legion home run. The J-Cubs host Daggett on Sunday at 1:00.